December 2015 – Reform in 5 Minutes! Last time, I promised the evidence that precludes us from exiting Medicare and the nightmare of penalties and data submission for quality, by just accepting self-pay and private insurance. Health & Human Services has created the Health Care Payment Learning and Action Network to work with private payers, employers, consumers, providers, states and state Medicaid programs, and other partners to expand alternative payment models into their programs. Members include HCSC (owner of BCBSMT), Anthem, United, Humana, Kaiser, CalPERS, AARP, Henry Ford Health System, Pacific Business Group on Health, and AHIP – the Association of Health Insurance Plans. You know where this is going – these programs will implicate ALL payers eventually. In the first bit, I told you your options: engage, accept lower income for same work, or stop practicing medicine. Incidentally, we at Monida consider it our responsibility to help you through this if you choose to engage. 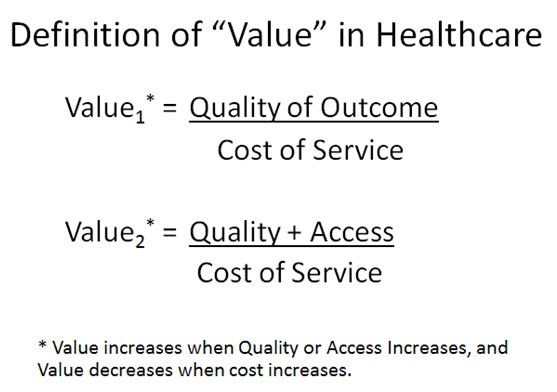 By the way, what is “value” in healthcare? You keep hearing this word used, usually in the context of how we will be paid. Health & Human Services secretary, Sylvia Burwell, comments, “85% of all traditional Medicare payments will be tied to quality or value by 2016 and 90% by 2018 through programs such as the Hospital Value Based Purchasing and Hospital Readmissions Reduction Programs. There are 2 value equations as seen below; the first is older and the second simply added a benefit to access in the calculation. This is why I have been stressing both high quality and low cost when we discussed penalties and future reimbursement methodologies.